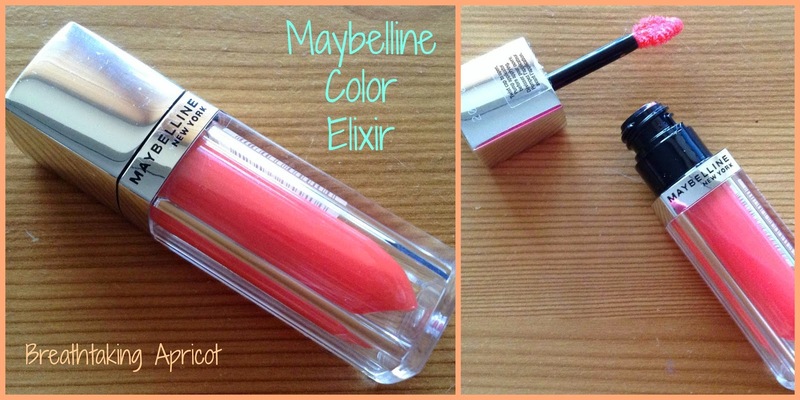 Maybelline Color Elixir by Color Sensational in 'Breathtaking Apricot' and arrival in Ireland! How I have LUSTED over the Maybelline Color Elixirs now for the longest time- watching all the bloggers and vloggers Stateside coo and profess their love for them for months has been excrutiatingly difficult. I don't know how many times I've checked the Maybelline stands here, just in case I spotted them, but alas it never came to be. When I got the news that these bad boys were to arrive in Ireland next month, I was overwhelmed with happy sensations. I'm showcasing the gorgeous shade Breathtaking Apricot today and letting you know whether these live up to the hype. The Maybelline Color Elixirs come in 20 shades, and it's not clear yet how many shades will be in Ireland, but these will probably vary between stockists in any case, as is the case with the lipsticks, colour tattoos etc. The packaging is just dainty- the product is contained within a perspex cuboid and the doe foot applicator is topped with a little shiny silver hat. Very simplistic, very appealing on the eye. Some people call these lipstick hybrids, Maybelline themselves promise that the Color Elixirs deliver the bold color of a lipstick, the cushiony care of a balm, and the glass shine of a gloss- I generally just think of them as long lasting pigmented glosses with a balmy feel on the lips. We won't argue over the symantics! I have the shade Breathtaking Apricot which is a gorgeous warm toned peachy pink with a hint of silver sparkle- and I mean hint. This is the perfect enhanced MLBB colour to wear with a strong smoky eye. It applies beautifully and evenly and feels cushiony soft and not sticky on the lips. This lasts really well for about four hours, but if you were on your best behaviour lips wise, you could probably stretch to five or six hours before reapplying. That could be due to the colour of this one though because it is not terribly dissimilar to my natural lip colour. This does not gather up on my lips or feel gritty over the course of time- in fact, it is perhaps one of the easiest products to just forget about. The lip gloss is quite a thick texture to apply but there is no tugging of the lips or tackiness to contend with. I don't find them drying or high maintenance. Overall, these were a huge hit for me and I'm already looking forward to picking up some more in September- as soon as they are spotted, I will let you all know. Are you only DYING to try these too? That looks beautiful on you Aisling! can't wait to try these! The color looks gorgeous on you!